002 - HMS Discovery, Robert F. Scott's ship (Discovery expedition). 010 - The James Caird, Ernest H. Shackleton's boat (Endurance expedition). 017 - The Fram, Nansen's and Amundsen's ship (Fram expedition). 050 - The Yelcho, Chilean tugboat (Endurance expedition). 262 - The HMAS Wyatt Earp, Lincoln Ellsworth's ship. 274 - Site of the construction of the Resolution and Adventure, James Cook's ships (Cook's Second Voyage). 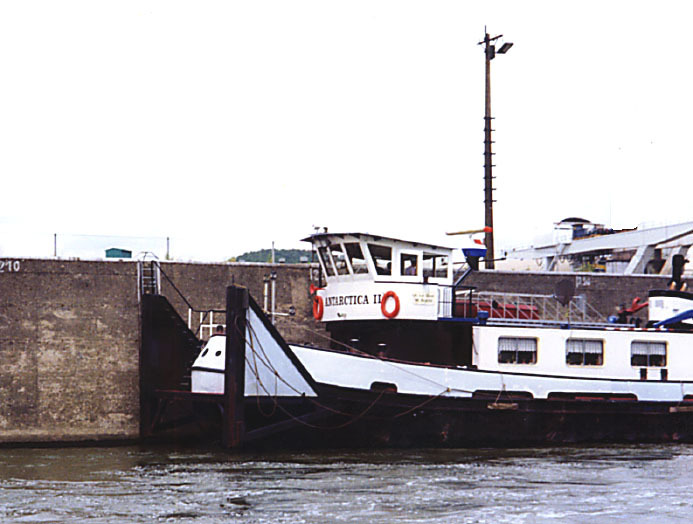 331 - Antarctica II, barge on the Meuse River. 396 - The HMS Scott. 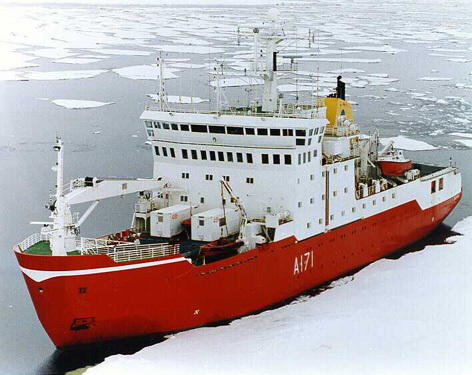 401 - The HMS Endurance. 402 - The Nathaniel Brown Palmer, US polar research vessel. 403 - The Hero, retired US ship. 436 - The James Clark Ross, British Antarctic Survey ship. 543 - The Uruguay, Argentinian ship. 547 - The RRS Ernest Shackleton, British Antarctic Survey ship. 549 - The Roald Amundsen, German sailing brig. 608 - Models of the Terra Nova, and the Aurora. 667 - The Southern Actor, restored Norwegian whalecatcher. 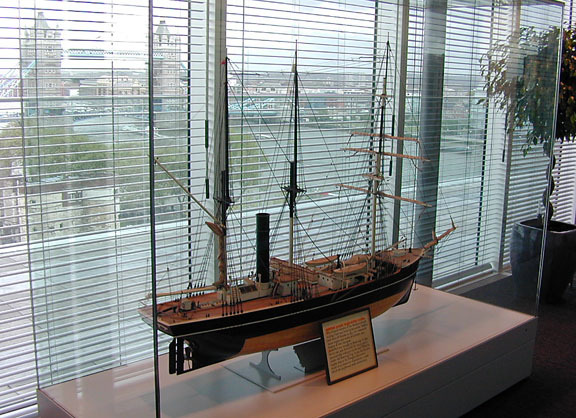 697 - Model of the Terra Nova. 776 - Glacier, US icebreaker. HMS Discovery Robert F. Scott's ship (Discovery expedition). Discovery Point, Dundee, Scotland, UK. The James Caird, Ernest H. Shackleton's boat (Endurance expedition). North Cloisters, Dulwich College, London SE21 7LD, UK.. The James Caird--A remarkable voyage 80 years ago. The James Caird is one of the more storied vessels in the history of Antarctic exploration. 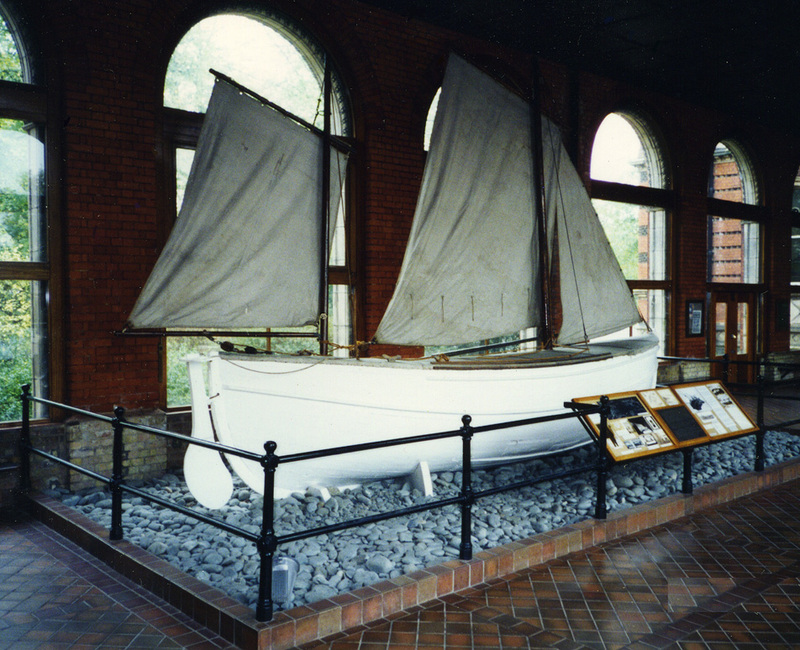 A whaleboat named for Sir James Caird, a Dundee jute manufacturer and the principal backer of Shackleton's British Imperial Transantarctic Expedition (1914-17), it made that remarkable sixteen-day voyage from Elephant Island to South Georgia, 800 miles across some of the most daunting ocean anywhere. Rescued from the Endurance as it was crushed in the Weddell Sea, hauled over the ice, altered by the ship's carpenter for added seaworthiness, the 23-foot long James Caird was sailed by Shackleton, Worsley, Crean, Vincent, McCarty and McNeish. The Fram, Nansen's and Amundsen's ship (Fram expedition). Bygdøynesveien 36 0286 Oslo, Norway. For many years after the Fram's return to Norway in 1914, the fate of the ship hung in the balance. The outbreak of the First World War diverted public attention elsewhere, but in 1916 the first Fram Committee was formed at the instigation of the Christiania Mariners Association, with Chr. Christensen, a prominent Norwegian shipowner, as president. There was general agreement that the Fram ought to be properly restored and preserved for posterity. A succession of committees worked untiringly to this end, but their plans met with considerable opposition and they found themselves constantly thwarted by petty considerations; nor were matters helped by an initial shortage of funds. Otto Sverdrup was one of the scheme's most enthusiastic protagonists. For many years he battled alone, but in 1929 Consul Lars Christensen of Sandefjord came to his assistance, and the Fram was towed to the Framnaes Shipyard there for repair. Sverdrup kept a keen eye on the work, to ensure that every detail of the restoration was correct. When Otto Sverdrup died in 1930, new champions stepped into the breach, men like Lars Christensen, Knud Ringnes, and Captain Oscar Wisting and continued Sverdrup's efforts to have the Fram hauled ashore and suitably housed. 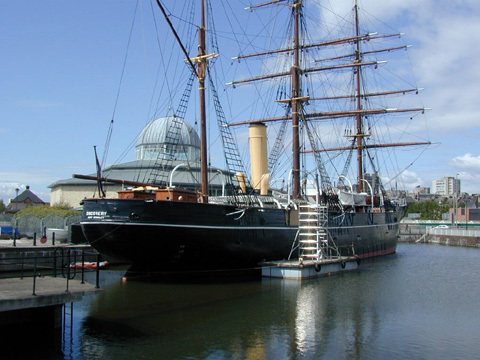 In the course of the next few years various schemes were launched to raise money to save the Fram, and many prospective sites were considered for her last resting place. A competition was held to find the best design for the museum, and the work was entrusted to the winning architect, Bjarne Tøien. In May 1935 the Fram was towed to Oslo and carefully hauled ashore where she now lies. Work then commenced on erecting a building about her, and on 20 May 1936 the Fram Museum was ceremoniously opened in the presence of His Majesty King Haakon VII and Crown Prince Olav. Source: Booklet: Fram Museum, 1971. The Yelcho Chilean tugboat (Endurance expedition). This time luck was with Shackleton, as the Yelcho some how managed to find a safe passage through the ice and arrived at a mist covered Elephant Island at around 1:10pm. on August 30th 1916. So it was that the Yelcho with her crew of 23 and cargo of 25 men from Shackleton's expedition ( McNish, Vincent and McCarthy were already on their way home to England) , headed back to Chile and on 3rd September 1916 stood off Rio Seco whilst Shackleton , always the one to seek publicity, telephoned the Governor of Punta Arenas to forewarn him of their imminent arrival. Shackleton made sure that none of the men shaved or cut their hair ,and that they wore their tattered soot covered clothing. Presumably he wanted the outside world to appreciate just what these men had been through. Luis, it seems was a modest man and it is believed that he declined a reward of �25,000 (an absolute fortune at the time) from the British Government. He said that he had "simply done his duty". He became a friend of Shackleton, and between 1930-1934 was the Chilean Consul to Liverpool. Quite an honour as at that time Liverpool was the greatest sea-port in Europe if not the world. The Yelcho was retired from active Navy duty in 1945, but was still used as a ship's tender at the Chilean School for Cabin Boys until 1958. In 1962 she was sold off, presumably for scrap. The HMAS Wyatt Earp, Lincoln Ellsworth's ship. Sank off of Queensland, Australia, in 1959. "The Wyatt Earp was to have an interesting future. In February 1939 she arrived at Hobart from the Antarctic to land the chief officer who had injured his leg. Ellsworth, who was on board, offered the ship to the Australian Government for �4,400 to service the Australian Antarctic base. This was accepted on 8 February, but no expeditions could be mounted before World War II broke out. The ship was converted to a munitions carrier at Garden Is. and later, as HMAS Wongala, she served as an examination vessel until paid off on 19 April 1944. She was then retained in reserve until handed over to the South Australian Boy Scouts on 3 March 1945. 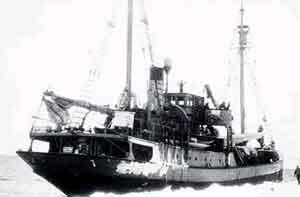 In 1947 she was selected for re-conversion to a polar expedition vessel and became HMAS Wyatt Earp. After a lengthy six-month conversion, bedevilled by strikes, at Birkenhead, Adelaide, she sailed for Mawson base on 19 December and was away three months. Unstable, leaking continuously and generally quite unsuitable, she made only the one trip. Sold again in November 1951, she reverted to the name Wongala and was used as a tramp ship between Tasmania and the Australian mainland. When her name was taken for a new vessel in 1956 she became the Natone and as such on 23/24 January 1959 she ran aground near Mudlow Rocks between Cairns and Brisbane. The crew got ashore on hatch boards while the old ship soon broke up." Site of the construction of the Resolution and Adventure, James Cook's ships (Cook's Second Voyage). Fishburn yard, Whitby, Yorkshire, UK. Antarctica II barge on the Meuse River. Seen on the Meuse River in Belgium. A Class 1 Icebreaker she was originally built in Norway in 1990 as MV Polar Circle. 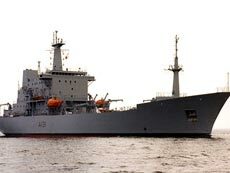 The RN chartered her in 1991 before she commissioned as HMS Polar Circle on 21 Nov 91. She was subsequently renamed HMS Endurance. The Ship's motto is "Fortitudine Vincimus" -- 'By Endurance We Conquer' The motto originates from that of the great Antarctic explorer, Sir Ernest Shackleton who made history in his ship, Endurance in his expedition south in 1914-15. The R/V Nathaniel Brown Palmer, US polar research vessel. In 1992, Edison Chouest Offshore Inc., Galliano, Louisiana, built and delivered a 94-meter research ship with icebreaking capability for use by the U.S. Antarctic Program for 10 years or more. The ship, Nathaniel B. Palmer, is a first-rate platform for global change studies, including biological, oceanographic, geological, and geophysical components. It can operate safely year-round in Antarctic waters that often are stormy or covered with sea ice. It accommodates 37 scientists, has a crew of 22, and is capable of 75-day missions. For ship deck layouts, lab photographs, schedules, equipment, ship user committee issues and a variety of other information regarding USAP research ships, go to the Raytheon Polar Services Company (RSPC) marine sciences web site. For specific information about cruises schedules, scientific equipment and other related science support information, see RSPC's the Nathaniel B. Palmer web page at http://www.polar.org/marine/nbp/nbpindex.html. 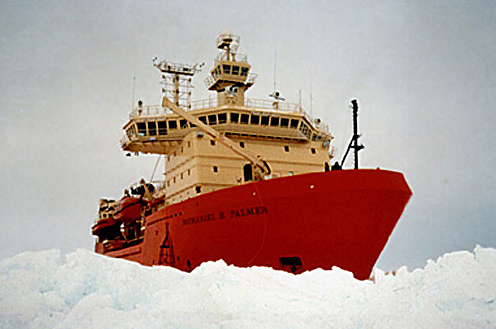 The ship is named the Nathaniel B. Palmer to commemorate the American credited with first seeing Antarctica. Nathaniel Brown Palmer, then 21 years old, commanded the 14-meter sloop Hero, which on 16 and 17 November 1820 entered Orleans Strait and came very close to the Antarctic Peninsula at about 63° 45' S. Later in his life, Palmer also won wealth and fame as a pioneer clipper ship master and designer. The Hero, retired US ship. "The Hero. Small, wooden-hulled American motor research vessel belonging to the NSF, which served Palmer Station between 1968 and 1984, before being retired due to dry rot in the timbers. 300 tons, it was named for Palmer's old sloop, and was framed with large oak timbers. Ketch-rigged, it had 2 decks and a superstructure. The mast was made of Oregon fir. It had 2 engines, and carried a crew of 12, as well as 8 scientists, and first pulled into its assigned home port of Palmer Station on Dec. 25, 1968, under the command of Capt. Sidney G. Hartshorne. 125 feet long, this floating lab operated in Antarctic waters between November and April every year, and wintered in South America. The best remembered captain was Pieter Lenie, who became skipper in 1972. On April 15, 1984, the Hero left Arthur Harbor for the last time, and was retired in October of that year, in favor of the Polar Duke." Source: Stewart, Antarctica An Encyclopedia, p. 450. The Hero ended up in Reedsport, Oregon, where it was to become a museum ship. The scheme never materialized and it was sold. Whereabouts unknown. The James Clark Ross, British Antarctic Survey ship. The vessel can be driven at a steady two knots through level sea ice one metre thick. To assist passage through heavy pack ice a compressed air system rolls the ship and prevents the ice from squeezing the hull. RRS James Clark Ross is equipped for geophysical studies, with a compressor bank to power a large seismic air gun array, a large aft" deck for deploying a wide range of equipment and a midships gantry. For biological studies, the vessel can deploy a wide range of sampling gear and benefits from modern underway instrumentation. The ship is designed with an extremely low noise signature to allow sensitive underwater acoustic equipment to operate effectively. 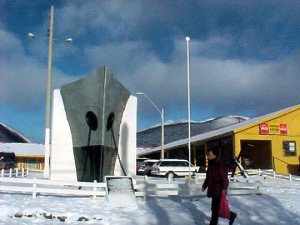 This photo was taken in the Falkland Islands in 1998. Dock One, Darsana Central, Buenos Aires, Argentina. Built in British shipyard, it was acquired in 1872 by President Sarmiento. Between 1898 and 1961, it ran as ship school of the Argentine Navy. This ship took 37 instruction trips around the world. It is 85 meters long and 13.3 meters its beam. Its deployed canvas covers an area of 3,358 square meters. 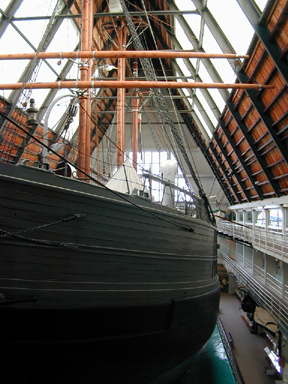 Its iron hull was modified so that it could sail Antarctic seas. In 1901, she was commended for the rescue of the Swedish expedition on board the Antartic, ice-trapped shipwrecked. It also served as Floating Navy School. Visits to the deck and interiors are held Monday through Sundays from 10:00 am to 9:00 pm. Admission is 1 Peso. Children under 5, free. Lines of Hull: Iron hull sheathed with teakwood, 31 mm. thick, covered with zinc plate in the underwater parts. Three watertight bulkheads. Engine: High and low-pressure steam engine, 475 HP, with two coal fired boilers, 97 tons. Bebis system bronze twin-blade propeller. 11 knots (as a maximum). Cruise speed: 6 knots. Ordnance: 4 Vavaseur guns, 7 inches, on iron gun carriages. One gun amidship in front of funnel, another gun behind the funnel and one at both bow sides. This changed as time passed. Crew: 14 officers and 100 crew members. The corvette Uruguay arrived in Argentine in 1874 as a member of the famous Sarmiento Fleet, the first fleet, compound of metallic vessels in the Argentine Navy. The corvette was the first seat of the Naval Academy and it contributed to guarantee our sovereignty over Patagonia taking part in the 1878 South Atlantic Cruise of Commodore Luis Py. In 1903 the destiny of the Swedish scientist Otto Nordenskjold's Antarctic expedition in which Sub-Lieutenant Jose Maria Sobral took part was unknown. Therefore, the Argentine Navy decided to appoint the corvette "Uruguay" to search the missing scientists. After reinforcing her structure and changing her rigging to navigate along frozen seas and bear heavy, storms, the vessel left on October 8, 1903 the order of departure being given by Presidente General Julio A. Roca himself. After sailing about 1 month, the vessel arrived at the Antartic coasts and some days later they found the lost expedition in Snow Hill island. The crew was isolated due to loss of Nordenskjold's Antarticship. The surprise was great when Sub-Lieutenant Sobral saw the silhouette of his training ship that was arriving to rescue them. After rescuing the survivors of ship Antartic, the corvette started back northwards. Finally, on December 2, 1903, both the crowd bunched together in the piers in Buenos Aires and more than thirty vassels with a concert of whistles and sirens received the corvette Uruguay escorting her entrance into history. From then on, she will go on rendering relevant services as the first Antartic vessel replenishing the Orkneys Observatory, carrying out hydrographic tasks and coastal surveys and especially reasserting national sovereignty over the area. 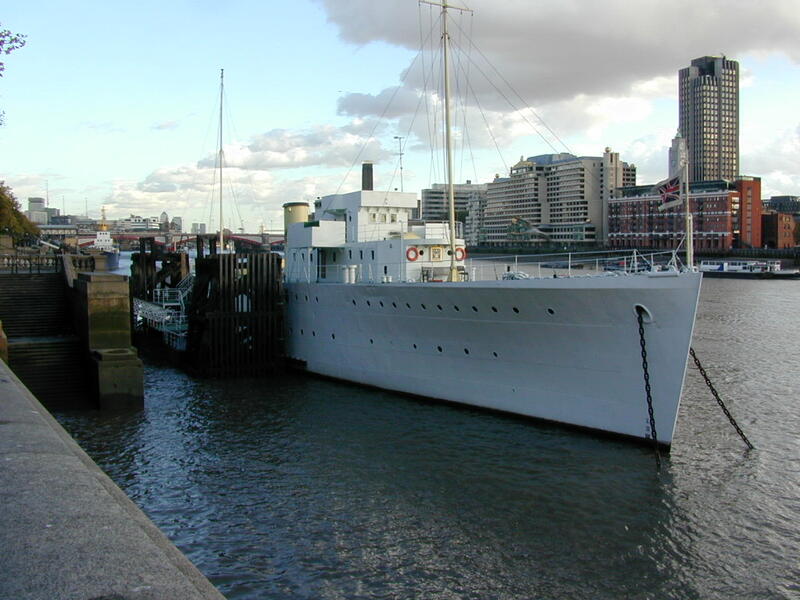 She was de-commissioned in 1926 after a 52 year-service. In 1954 she was reconditioned as a museum ship of the Naval Academy with a honour crew. In 1967 she was declared a National Ancient Monument. 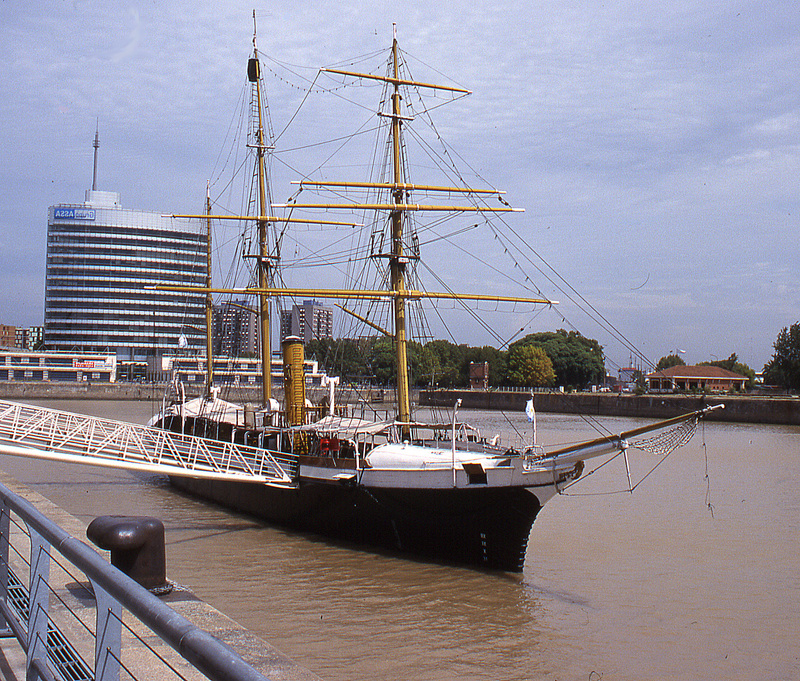 In 1974, a hundred years after the creation of the Sarmiento Fleet, she entered again the port of Buenos Aires with the same integrity as in 1903 and was accompanied by a similar enthusiasm. The RRS Ernest Shackleton, British Antarctic Survey ship. The RRS Ernest Shackleton was built by Kverner Klevin Leirvik A/S, Norway as the MV Polar Queen for the Norwegian company Rieber Shipping of Bergen in 1995. 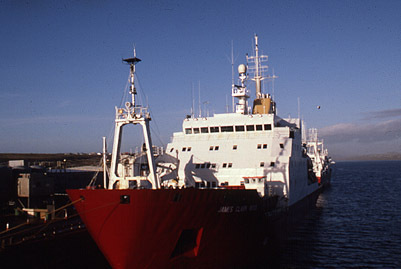 The British Antarctic Survey acquired the ship in August 1999. 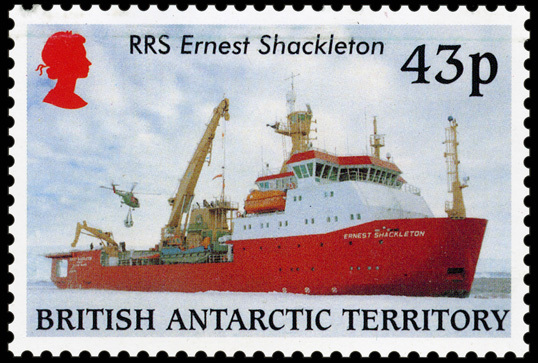 The vessel was renamed RRS Ernest Shackleton and re-registered in the Falkland Islands. Sir Ernest Shackleton, the famed Polar Explorer, brought all his men to safety when his ship Endurance was crushed in the ice. The epic journey from the Weddell Sea to South Georgia remains one of the legendary tales of survival. The vessel is ice strengthened and capable of a wide range of logistic tasks as well as having a scientific capability. 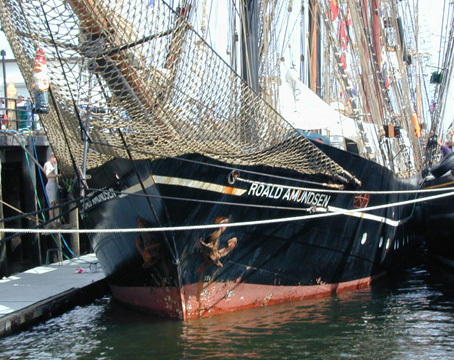 The Roald Amundsen, German sailing brig. A German tall ship built in 1952. This photo was taken in Boston in July 2000 during a "Tall Ships" visit. Models of the Terra Nova and the Aurora. 5th floor, Marsh & McLennan European headquarters, near the Tower of London, London, UK. Marsh & McLennan bought out Bowring Brothers which had owned both the Terra Nova and the Aurora. 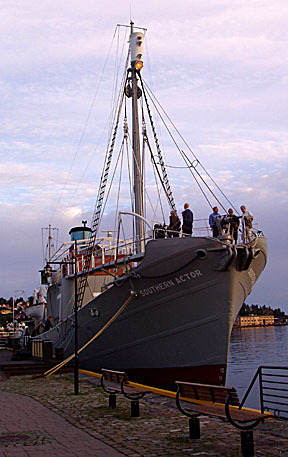 The Southern Actor, restored Norwegian whalecatcher. This restored whale catcher is an operating ship which has as its homeport this shipyard. 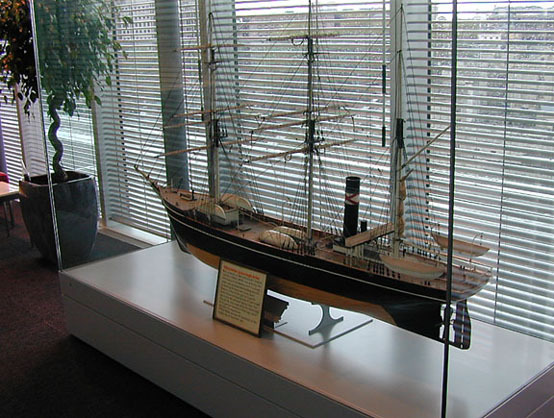 Model of the Terra Nova. Model room, Master Mariners, HQS Wellington, Embankment, nr Temple tube station, London, UK. 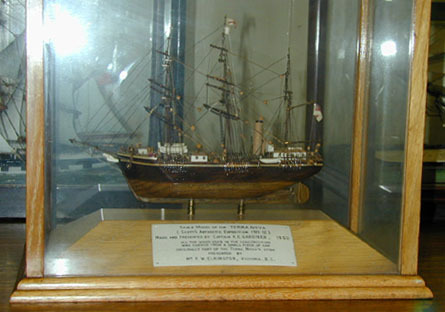 "The Mariners have a large number of ships' models. This is the smallest of them, ca 8" long by 6" tall, in a glass case. The label says: Scale Model of the Terra Nova | (Scott's Antarctic Expedition: 1911-12) | Made and Presented by Captain R. E. Gardiner, 1950 | All the wood used in the construction | was carved from a small piece of oak | originally part of the Terra Nova's stem | Presented by | Mr. P. W. Elkington, Victoria, B.C." Glacier, US icebreaker in process of restoration..
Suisan Bay on the Sacramento River approximately one hour northeast of San Francisco, California.